Here’s what you need to know about fire-rated glass and framing to get started on your next project. Learn more about fire-rated basics. What is fire-rated glass and framing? If you’re new to fire-rated glass and framing, it can be challenging to discern which product is best suited for a particular project. However, once you learn a few key fire-rated classifications such as “fire-protective” and “fire-resistive,” you’ll be well on your way to choosing an appropriate product for your project. Read on below for a primer on fire-rated glass and fire-rated framing, and be sure to check-out our fire-rated FAQs. The term “fire-rated glass” refers to the complete set of fire-rated glazing products available in the market. Within that wide category, designers can choose from both “fire-protective” and “fire-resistive” glazing products, depending on their project’s requirements. Fire ratings for glass, which are noted on a product’s label, range from 20 minutes to 3 hours, with the specified number corresponding to testing by independent laboratories (in accordance with fire test standards). The rating reflects the amount of time the material is anticipated to remain in place to help stop the spread of fire and smoke. Fire-rated framing works with fire-rated glass to protect openings from the spread of fire and smoke, and in some cases, radiant and conductive heat. Because fire-rated framing and fire-rated glass work in tandem to provide compartmentation, the frames and glass must carry the same fire rating and classification (fire protective or fire resistive) in accordance with the International Building Code (IBC). What is the difference between fire-protective and fire-resistive glazing? Fire protective: Fire protective means the glazing defends against the spread of flames and smoke for its designated fire rating. Such materials include traditional wired glass, glass ceramics, and specially tempered glass. 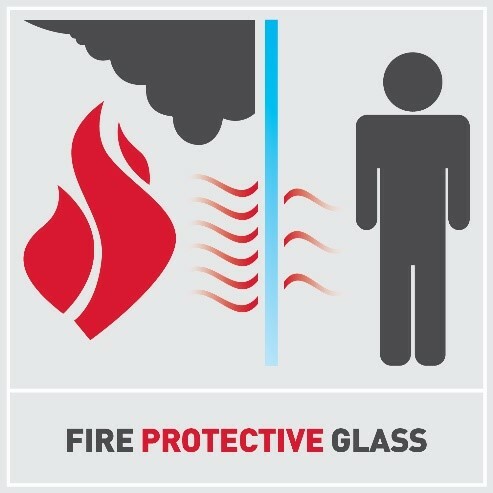 Fire-protective glazing typically is suitable where building codes allow “opening-protective” assemblies, including doors, sidelites, and windows. Such glazing is available with fire ratings ranging from 20 to 180 minutes, with varying impact safety ratings. Since it does not block the transfer of radiant and conductive heat, it is subject to area and size limitations under the applicable building code (typically the International Building Code – IBC, in the U.S.) and/or authority having jurisdiction. Fire resistive: Fire resistive glass provides the same defense against flames and smoke as fire-protective glazing, but adds further protection by blocking the transfer of radiant and conductive heat. It is tested to the stringent fire-resistance test standards for walls, including ASTM E119: Standard Test Methods for Fire Tests of Building Construction and Materials and Underwriters Laboratories (UL) 263: Fire-resistance Ratings. Given these performance benefits, fire-resistive glazing assemblies are typically suitable where building codes require an assembly designated “fire resistant” to enclose a space. 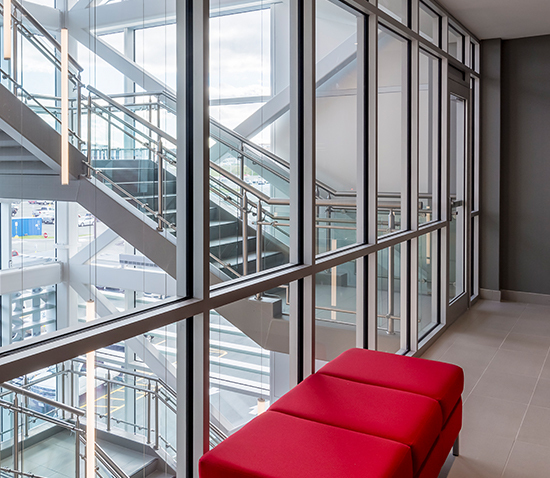 Examples include wall applications requiring a 60-minute or greater fire rating that must meet temperature-rise criteria, such as stairwells, exit access corridors, or other fire barriers dividing interior construction. Due to its heat-blocking characteristics and classification as fire-resistive wall construction, it is not restricted to 25 percent of the wall area. This provides design teams with greater flexibility when working to create light-filled and inviting spaces that meet strict fire and life safety criteria.